Tom has always been interested in stone, ever since he was a kid. he collected it, studied it in school, climbed on various types of it, now he finds himself building with it! 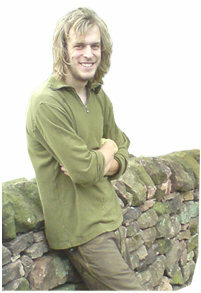 He studied outdoor activities and countryside management at Derby University, then became a rock climbing instructor. He got bored of this after three or four years of working in a council run climbing wall and decided that he needed a change. He therefore decided to enrol on the Master Craftsman certification scheme at the Eco Centre, Wirksworth Derbyshire, where he was taught the trade by some of the best wallers in the world - Trevor Wragg, Steve Clifton, Andew Brown-Jackson and Gordon Wilton (Who works for the famous sculptor Andy Goldsworthy). He now works as full time self-employed Dry Stone Wall Builder, and continues to build up his experience and eventually he hopes to become a Master Craftsman.